Pirita´s, Mika's and 7 -year-old daughter's own family trip for three 13 - 22 July 2014. After landing in Geneva, we went to baggage collection area, which is in Arrival level. We got free Unireso tickets which allowed us to travel for free for 80 minutes. Then we moved towards Geneva center by train: Genève-Cornavin, gare CFF. Duration 6-8 minutes. Trains every 12 minutes. Our hotel was only 3 minutes´ walk from the train station. You can reach downtown Geneva and the old town in a 15-minute walk and international organizations including the United Nations, in 10-12 minutes by bus. The hotel gave us our free tickets to travel around Geneva. The tickets are valid during the time spent in the hotel. After check-in we went to have a lunch. We had Pasta Carbonara and pizza and had Orangina lemonade and Henniez water. After lunch it was time to see some 007 book locations and other 007 related places. We found Richemond hotel at Rue Adhemar-Fabri, 8. This hotel is mentioned in John Gardner's 007 book "Role of Honour" (1984). We also found Hotel de la Paix at 11 Quai Mont Blanc, the hotel can be seen in TV series "The Persuaders" starring Roger Moore, in the episode "The Ozerov Inheritance". Later we visited Pont du Mont Blanc (Mont Blanc bridge), which is mentioned in the Ian Fleming's book "Goldfinger" (1959). 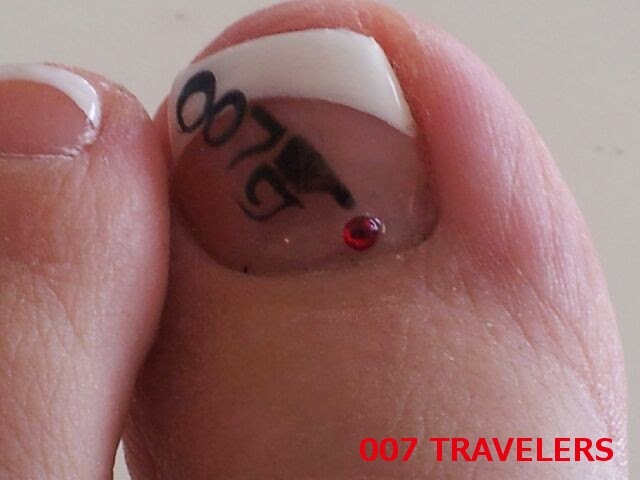 We knew that former 007 restaurant Bavaria, mentioned in 007 book "Goldfinger" had changed its name. It is now known as Le Relais de I´Entrecote. The name was not only thing changed. We found its former location at 49, Rue de Rhone. The restaurant had moved to address 6, Rue Pierre Fatio in April 2014. This location at 49, Rue de Rhone, however, was its original location. "Bond motored across the beautiful Pont du Mont Blanc and along the brightly lit quai to the Bavaria, a modest Alsatian brasserie that had been the rendezvous of the great in the days of the League of Nations. He sat by the window and drank Enzian washed down with pale Löwenbrau. He thought first about Goldfinger. There was now no doubt what he was up to." Soon we found Quai Wilson, there is this office house, which is mentioned in the same 007 book. "Behind the desk there was a reproduction of the Annigoni portrait of the Queen. On the other walls were advertisements for Ferguson tractors and other agricultural machinery. From outside the wide window came the hum of traffic along the Quai Wilson. A steamer hooted. Bond glanced out of the window and watched it ride across the middle distance." With city tickets given by our hotel, we traveled with a little city boat around the Lake Geneva. Our next stop was Quai Gustave Ador, where Bond had two rooms above an old candy shop in John Pearson's 007 book "James Bond, The Authorized Biography of 007" (1973). agreed with Ian Fleming on the subject. For both of them it had, what Fleming called, a ‘Simenon-like quality – the quality that makes a thriller-writer want to take a tin-opener and find out what goes on behind the façade, behind the great families who keep the banner of Calvin flying behind the lace curtains in their fortresses in the Rue des Granges, the secrets behind the bronze grilles of the great Swiss banking corporations, the hidden turmoil behind the beautiful bland face of the country’. This then was Switzerland for Bond, and he was fascinated by it. He had two rooms with a respectable Swiss lady over a sweet-shop off the Quai Gustave Ador." "He enjoyed the rackety routine of life with old Frau Nisberg; he enjoyed the silence of his room with its views across the lake; he enjoyed Frau Nisberg's cooking." rather liked it after Eton, stayed there until sixteen, then got fed up with it. Decided it was time to move on. Got to Geneva University. And that was where the trouble really started.’"
After that it was time to see Parc La Grange, which was beautiful. We also visited children's playground nearby. We had dinner in Pasta Prima restaurant. After dinner it was time to go to our hotel to get some rest. Geneva part 2/2 will follow in the end of our Switzerland tour. Next stop, however, Bern!